Bentley has been very active in the past twelve months, now the company is thinking about an SUV very hard and possibly a hybrid Bentley for the future. Last week during the press days of the 2011 LA Auto Show TorqueNews sat down with Bentley's Christophe Georges, President and Chief Operating Officer, who shared how active the company has been in the past twelve months and how positively that has influenced its sales. At the same time, board member responsible for sales and marketing, Alasdair Stewart told LA Auto Show host Alan Taylor that Bentley is thinking about an SUV. This year Bentley brought three cars to the 2011 LA Auto Show all of them introduced in the past 12 months. It shows the dynamic of Bentley rebounding after the crisis with a new product line. North American sales are up 33 percent in the past year. The company showed the new Continental GT, its convertible version called New Continental GTC and four-door Mulsanne interior concept. New Continental GTC was introduced in America in April. It has been an evolution from a previous revolution when Bentley launched the first Continental GT in 2003-2004. This family of cars has helped to transform the company and has multiplied Bentley’s business by factor of 10, creating a new market segment. Explained semantically, on one side Rolls Royce and Ferrari are market segments above everything else and are two times more expensive. On the other side are the premium cars and the likes of Mercedes-Benz. But there is a market segment that falls in between. Thus, Bentley Continental GT comes to fill this very market segment that is between Rolls Royce and Mercedes. "Continental GT has been a benchmark and the new Continental GT has been an evolution of this benchmark," said Georges. The car has been successful and the New Continental GTC is coming next month. The company launched this convertible in Los Angeles because California is a big market for convertibles. 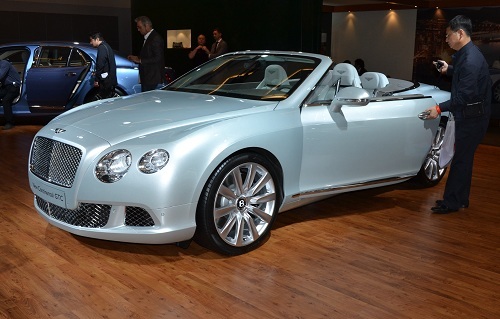 About 50 percnet of Bentley's convertibles are sold in California. Therefore, this is an ideal location to launch the car at the 2011 LA Auto Show not only because of the nice weather, but also because of the lifestyle. Mulsane interior, with an iPad station connectivity, is a new concept, which Bentley brought to the show. In the back of the car you can put 2 iPad stations and a big screen in the middle. Two back-seat passengers can work either together or proprietary. Keyboard is there too. One can enjoy the ride and be entertained. The concept is very interesting. Mulsane has been introduced in the market last year and has been doing well in terms of sales. The new interior concept provides the possibility to watch movies download videos from the internet or just work on a presentation before a business meeting. It's quite nice and user friendly, a way to efficiently use the time in a car. While driving the car, passengers are connected through a Wi Fi Center at all time. The concept has just been created, but it will not be too long before it appears in the car. It will be ready in "few number of months," said Georges. The car already exists and the new concept is only the interior connectivity. Mulsane has been successful and exclusive. The lines of the design have moved Bentley to more contemporary direction in the New Continental GT (or GTC). The company is using a supersonic technology from aerospace. Bentley says it is the only manufacturer using this technology. It heats aluminum in 500 degrees and when the material cools down the company then defines the lines of the design. The automaker has largely kept the previous design theme of the Continental GT. "We wanted to keep the design of the previous car to keep the car's identity, but the current design is much more contemporary. In a way we have sculpted the Continental GT. It is a real sculpture," said Georges. Bentley has 50 people working in the design department and 800 people in engineering. These two departments are closely connected to each other so the engineers can produce what the artistic designers design. Bentley also incorporates some ideas working with design schools and students who convey Bentley’s values in their own way. “It's very important for a company to give freedom to the designer artist to come up with his/her own interpretation and of course to make sure that those interpretations can be produced effectively within Bentley line," said Georges. Do you want to sell Bentley cars to wider age demographics? Christophe Goerges and Bentley have an interesting approach toward age demographics. While number of car makers try to attract new age demographics to sell more cars, Bentley is not concerned with this marketing tactic. Instead, it wants to create a dream and let whoever shares that dream, come to it and achieve it in his or her own time. The company is rather concerned to lead in the luxury segment in terms of market relevance.The New Continental GT has a great innovative design. It is sportive, friendly and the company takes care of the green aspect of the environment. Today’s Bentley is a combination of everything you can dream of having in a car. Speaking about the future of Bentley, Georges said that on one side it is important to be attentive on the new technologies and to what the customer wants the car to do. On the other hand it is also important to work on technologies that the luxury automaker believes will help it to be responsible to the marketplace. "It’s a little bit early today , but hybrid solution is an interesting one. We are working on this idea. Diesel solution is going to be interesting also, but I don’t believe that especially in America the customer in our category is ready for it,. Diesel technology is fantastic, especially our group has a quite level of knowledge about it. So a lot of things are possible, but you need to be consistent with Bentley and you need to be able to monitor customer expectations, said Georges while giving a little insight about where the company might be going in the next several years. "We are part of a large group, we have the best technologies within the group, which gives us access to a lot of synergies also. So we are quite fortunate to be able to jointly work within our group to share creative engineering to move from one direction to the other, but still work on a lot of different solutions," said Georges. Bentley has been owned by the Volkswagen Group since 1998 and the production is still based in Crewe, UK. Regarding the future, more Bentley sales may come from China. US is Bentley’s biggest market, but sales in China are growing very fast. China is not bigger than U.S. but it has got the potential to be so, board member Alasdair Stewart told LA Auto Show host Alan Taylor. This year Bentley’s sales are 90 percent up in China from a smaller base than U.S., but the country has a network of 20 delaerhips. These Bentley dealerships are not only in China's primary cities, but also in secondary cities. Bentley largely sells four-door cars in China because the Chinese like to seat in the back. India is good too, but its not comparable to China. Russia is also a big market for Bentley, but again, it’s not comparable to China. Russian market is back after the crisis. In 2007 Bentley opened a dealership in St. Petersburg in Russia and according to Georges, it's doing well. America, China and UK are the largest markets for Bentley.